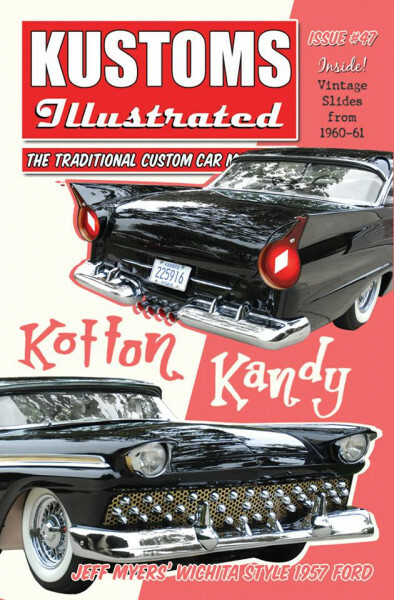 Produktinformationen "Kustoms Illustrated Issue #47"
Issue #47 of Kustoms Illustrated Magazine is hot off the press!! This issue’s cover features the wild “Wichita-style” ’57 Ford Fairlane built by Jeff Myers of Premier Body & Paint in Koolsville, Kansas! “Kotton Kandy” is not only a beautiful custom, but also has a great and inspiring story to go with it. We gave Jeff our “Award of Excellence” for his Fairlane at the West Coast Kustoms show in Santa Maria. See why for yourself in the new issue! Speaking of Santa Maria, we have massive coverage of the show. Many newly built customs debut at the Cruisin’ Nationals every year along with historic restorations and old favorites. Check them out in full color! This issue also features an exclusive article of vintage show customs from the 1960-61 era. We recently gained access to over 700 vintage color slides that have never before seen print and we present them to you in a giant multi-part article that will make your head spin. If you love old customs, then this issue is for you! We also have several other custom car features, including a ‘60s-style ’62 Buick Electra 225, a late ‘50s-style ’46 Ford sedan, and an exclusive article by custom car historian, Rik Hoving, on the freshly restored Leo Lyons “Modern Merc” 1950 Mercury. Kustoms Illustrated also remembers the legendary Bill Hines in this issue. Weiterführende Links zu "Kustoms Illustrated Issue #47"
Kundenbewertungen für "Kustoms Illustrated Issue #47"